← New This Afternoon: The family of Eric Garner join Rev. Sharpton and NAN at the Saturday action rally tomorrow! 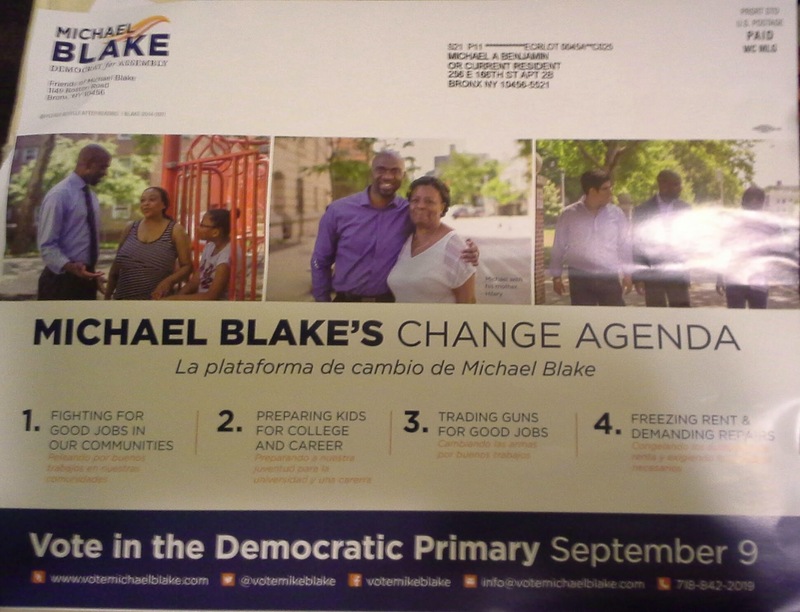 The glossy mailer presents Blake as the son of Jamaican immigrants who went “from no house to the White House.” He offers his “Change Agenda” for good jobs, college and careers, ending gun violence and freezing rents. The mailer’s “hope and change” theme seems to have a familiar ring. 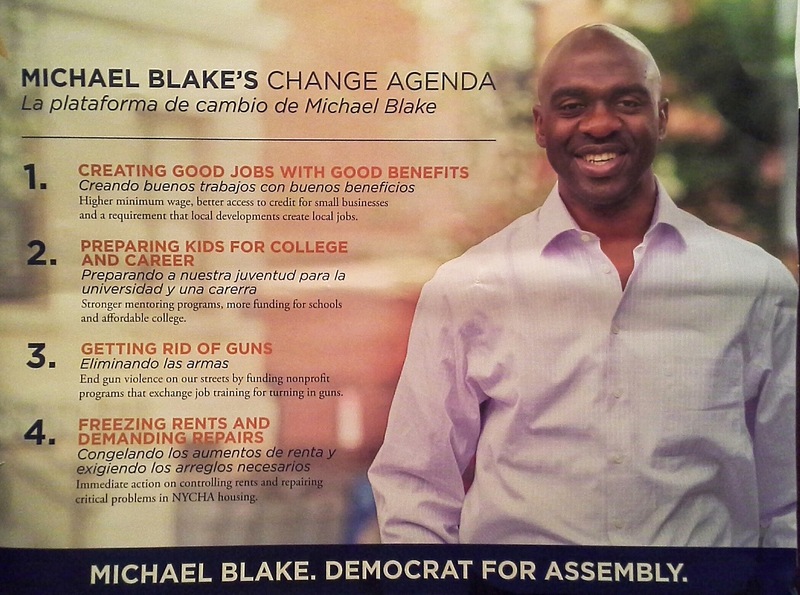 Michael Blake became the first candidate to send a district-wide mailer. 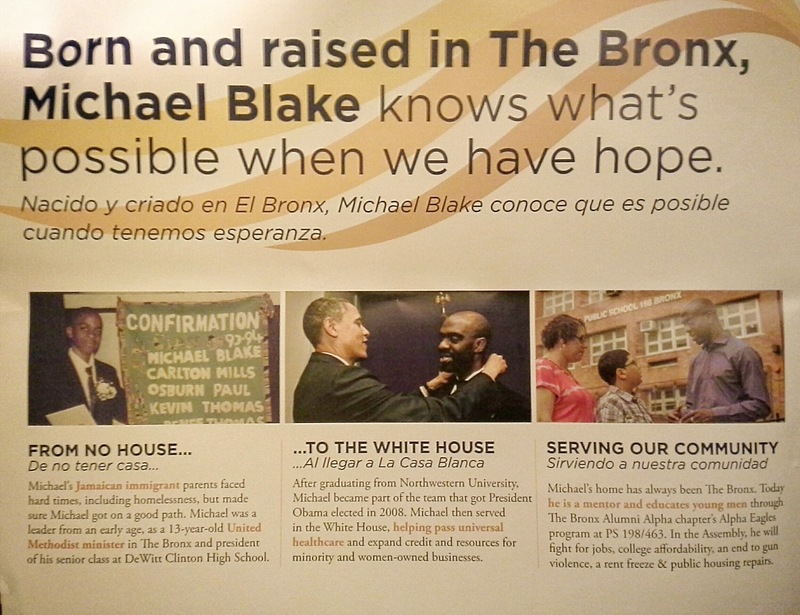 Naturally, the expensive full-color campaign brochure features a photograph of Blake with President Obama. Blake takes credit in helping to pass Obama’s signature universal healthcare legislation as well as expanding assistance to minority and women-owned businesses. Blake, a Democrat, lists his 1199SEIU and NY Communities for Change endorsements. The mailer went out before Blake scored the endorsement of the black-owned NY Amsterdam News on Thursday. Last week, Blake announced that he had raised a $160,000 war chest (from donors nationwide). Blake has spent almost $100,000 without securing his place on the September 9 Primary Election ballot. Blake’s campaign consultants include BerlinRosen, which guided Mayor Bill de Blasio to victory last year, and Strategic Persuasion, which is helmed by veteran campaigner, Hank Sheinkopf. This week, supporters of Blake’s main rival, Marsha Michael, a court attorney favored by the Bronx Democratic County Committee, filed specific objections seeking to invalidate his petition signatures and disqualifying him because he doesn’t meet state constitution’s residency requirements. The petition challenge will be hashed out before the city Board of Elections and in judicial proceedings before a special referee. The proceedings should be completed in the next few weeks. The other candidates running in the 79AD include businessman George Alvarez, entertainer Frederick Ricks, school aide Raul Rodriguez and tenant leader Lanita Jones. Alvarez has raised over $40 thousand ($25K cash-on-hand) and Rodriguez, $1050 ($745 cash-on-hand), while neither Ricks nor Jones had filed campaign disclosure reports by the state-mandated July 15 deadline. The Southeast Bronx Neighborhood Centers, Inc. will host a candidates forum on Thursday, September 4 at the McKinley Community Center, 751 East 161st Street. The forum begins at 7:30pm. Former NY1 newsman Dominick Carter and I will be panelists questioning the 79 AD candidates. 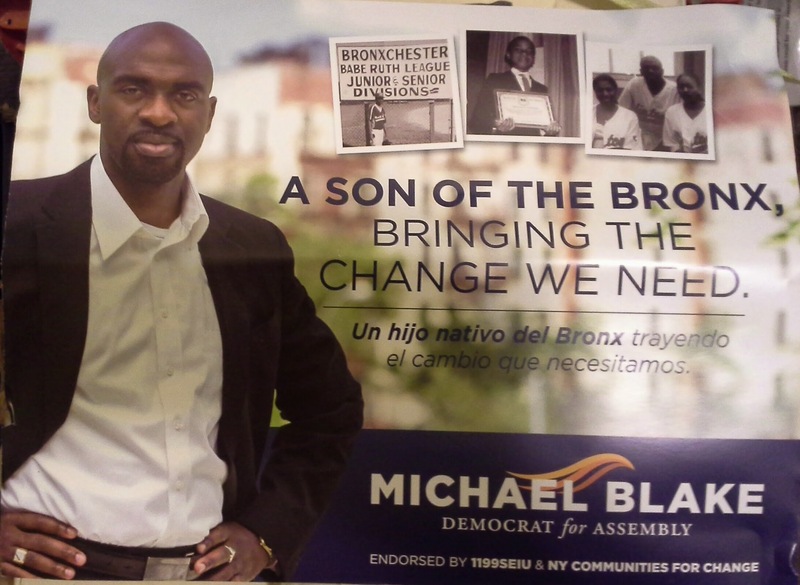 Image | This entry was posted in African Americans, Government, Politics, Voting Rights and tagged BerlinRosen, bronx, hope and change, Mike Blake, Morrisania, NY State Assembly, President Obama, south bronx. Bookmark the permalink. The Mike Blake First Mailer article is solid and balanced. The politically initiated and uninitiated can get much from this information packed piece. Hopefully the voters of the 79th AD will read it because they may find themselves voting in the most interesting Bronx race in the 2014 NYS primaries.